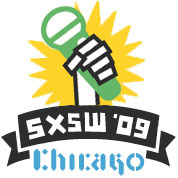 The Hood Internet will be live-blogging (well, live-tweeting mostly) their 2009 SXSW experience for us all weekend long, starting tonight. DJ STV SLV and ABX aren't on the official list this year, but they've got four gigs lined up anyway. Follow along as they broadcast their antics from down in Austin. Oh, and if you're in Austin and want to give a shout out, or you're in Chicago and just want to add your $.02 to the live-tweeting, just mark your entry #gbsxsw. Here's the Hood Internet's schedule as it stands now, but you know they'll be playing more shows on the fly as well! Thursday, March 19 — at Canvas (105 E. 5th St.) for The Lose Control Party, 10pm. Friday, March 20 — at Hi-Lo (301 W. 6th St) w/ ninjasonik, death set, and more for THE FMLY AUSTIN BLOWOUT, on and off from 9pm on. Saturday night — at The Lodge (411 E. 6th St.) w/ Bald Eagle, Kid Color, Black Holes and Vyle for the IT'S CHICAGO party — they're on at 1am. Follow along as they broadcast their antics from down in Austin. OHhh? !